Title: 5G is the solution for every aviation challenge – NOT! Networks are constantly evolving seizing new business opportunities. Airspace coverage is still a widely untouched form of evolution and faces some dedicated challenges compared to ground usage patterns. However, as the digitalization of aviation continues, new connectivity demands arise which cannot be fulfilled in the classical Telco way. Mission criticality in aviation, available spectrum and 3rd dimension network planning are only three challenges on the way ahead. Ralph will give insights how Deutsche Telekom addresses these issues from a technology perspective and which fundamental mindset changes are needed in both industries to effectively join forces. Ralph Schepp is Vice President of Technology Strategy, Program Manager Drones at Deutsche Telekom. 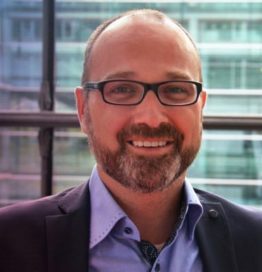 Ralph is responsible for key projects and programs in Deutsche Telekom’s CTO area, and has solid experience in strategy development, transformation, and innovation management, with a strong focus on ICT and high-tech. In his current role he is managing DT’s ‘connected drones-program’, the radio spectrum portfolio and group technology strategy.